Hong Kong’s history reveals a strong tradition of entrepreneurship; from a textile, manufacturing and export hub in the 1950s to a services-based economy from the 1970s. This has defined modern Hong Kong, which is supported by the four pillars of tourism, professional and producer services, financial services, as well as trade and logistics. The city is also recognised as the premium gateway to mainland China. However, the dominance of its core competitive industries is no guarantee of its future success, in particular with the emergence of the New Economy. 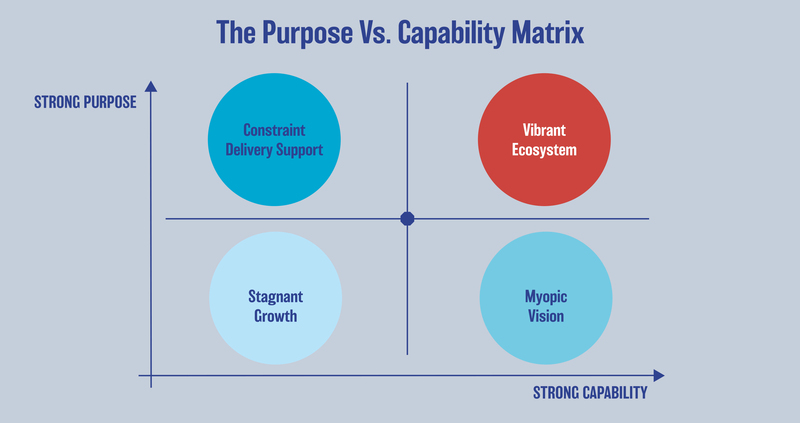 In addition, a framework, which brings together two critical and complementary dimensions: Purpose and Capability, was utilised to provide further analysis. 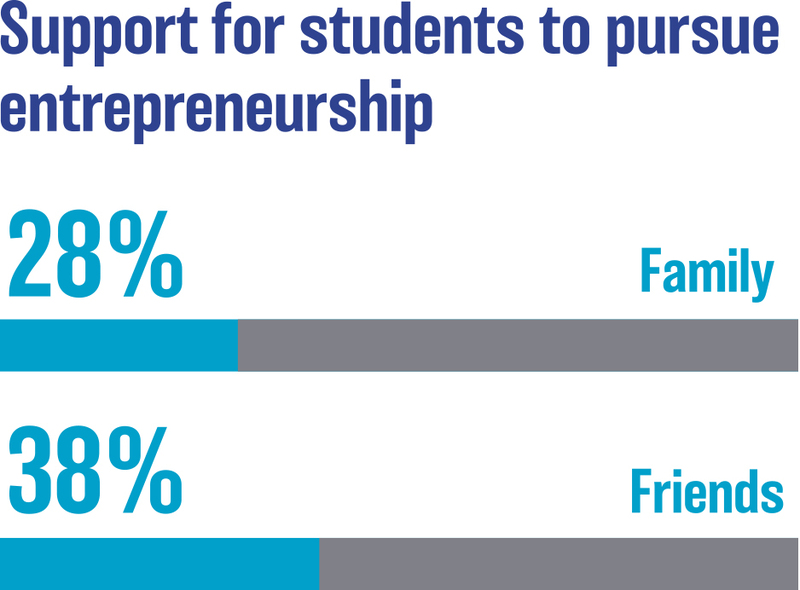 The study reveals that Hong Kong has inspiring entrepreneurs who are fuelled by a strong sense of purpose. They recognise the societal and economic contribution entrepreneurship has to offer – developing new ideas, keeping society dynamic, addressing social issues as well as creating new opportunities. Moreover, their motivations for going into entrepreneurship are often to develop new technologies, reach under-served markets, and advance the development of their communities, with less regard for monetary factors and personal career agendas. This desire to drive change, however, is inhibited by a number of challenges. One of the key barriers to participation is the tendency of Hong Kong people to choose careers with more stable income at the expense of personal aspirations. The preference of more traditional career paths is reinforced by societal expectations, as support from family and friends is low. 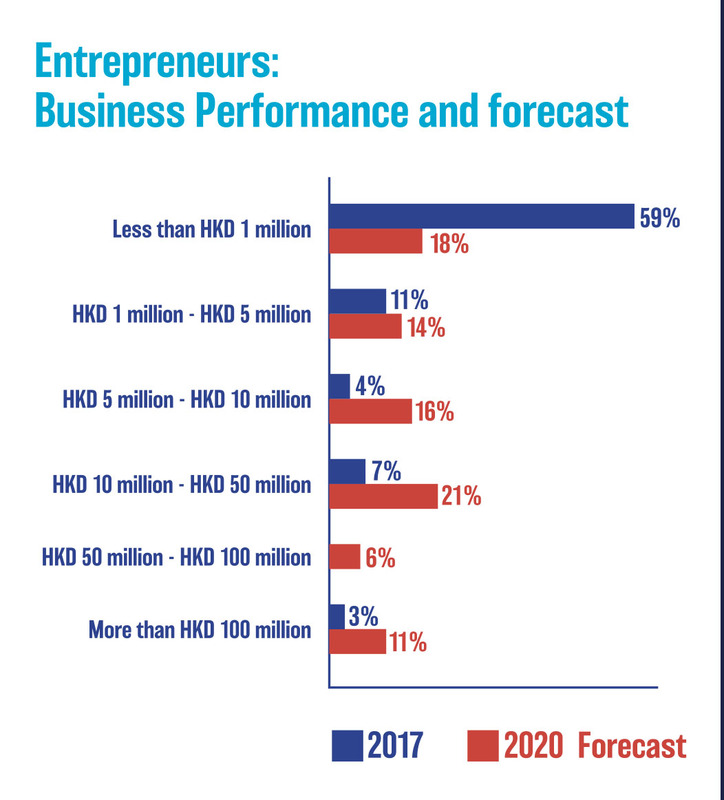 The study shows that entrepreneurs were too modest in the outlook of their ventures, with 48% expecting to only generate revenues under HKD 10 million by 2020. This has a knock-on effect on start-up investment, as many institutional investors would only invest in businesses that have strong growth potential. 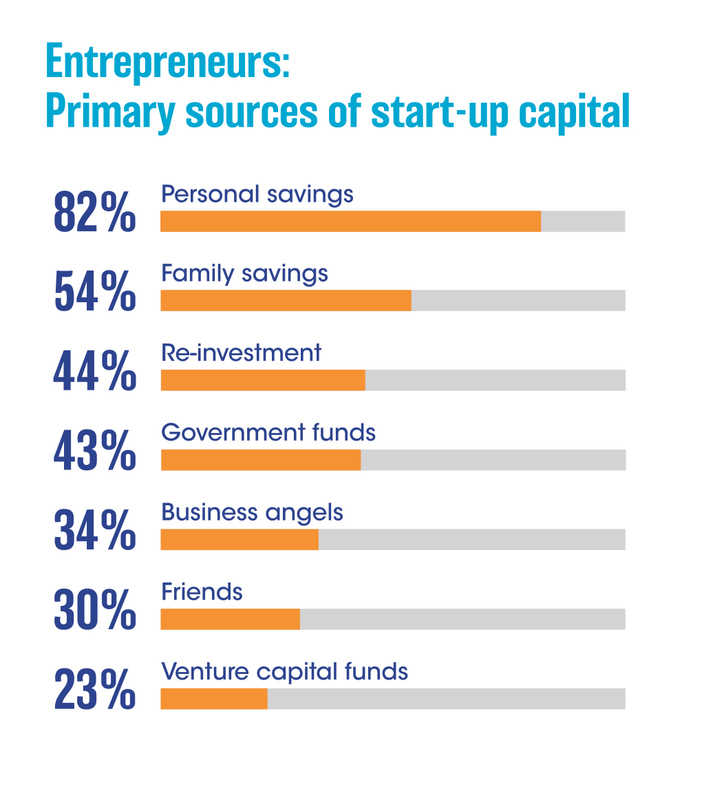 It is also a reason why startups in Hong Kong are having to rely so much on personal as well as family savings for financing. 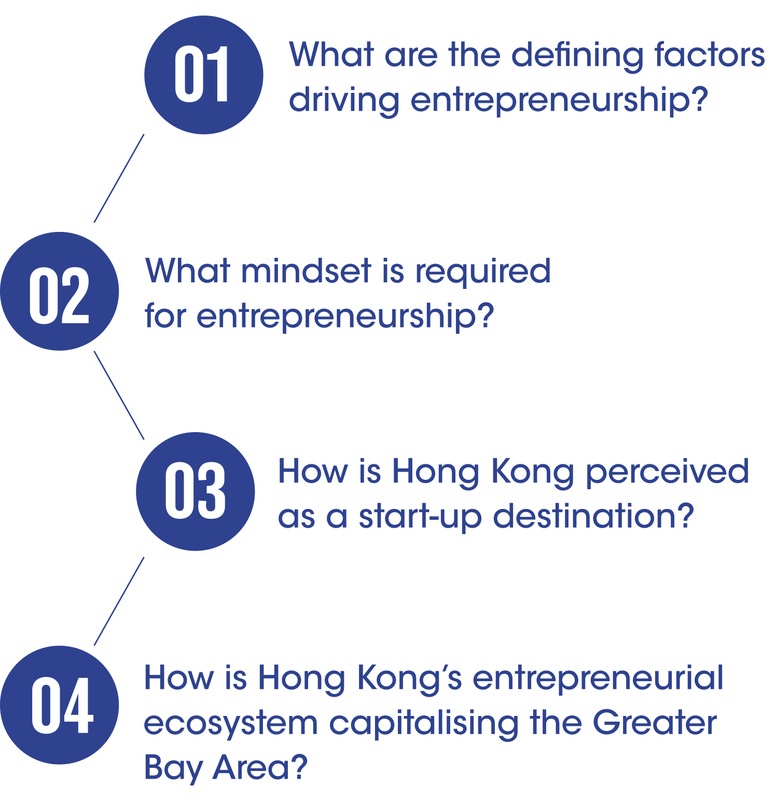 These findings reveal the need for Hong Kong to develop a stronger entrepreneurial mindset. 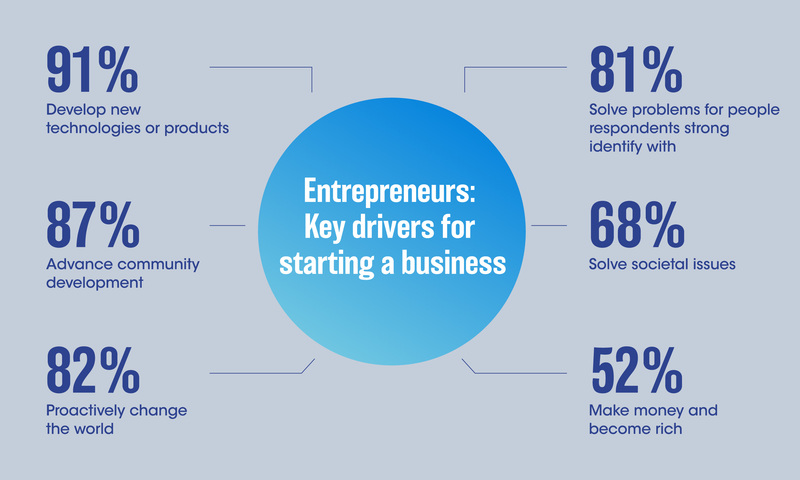 Only 15% of entrepreneur respondents believe the city’s entrepreneurial mindset can be considered a competitive edge. To overcome these barriers and foster the development of the Hong Kong entrepreneur ecosystem, the government and business sector have introduced multiple reforms, policies and initiatives to further spur innovation, including innovation hubs, co-working spaces and funding options. Hong Kong has attracted a number of world-class research institutes although our study also reveals that entrepreneurs either have little or no access to many of these services and infrastructure, which includes official R&D support and mentoring. 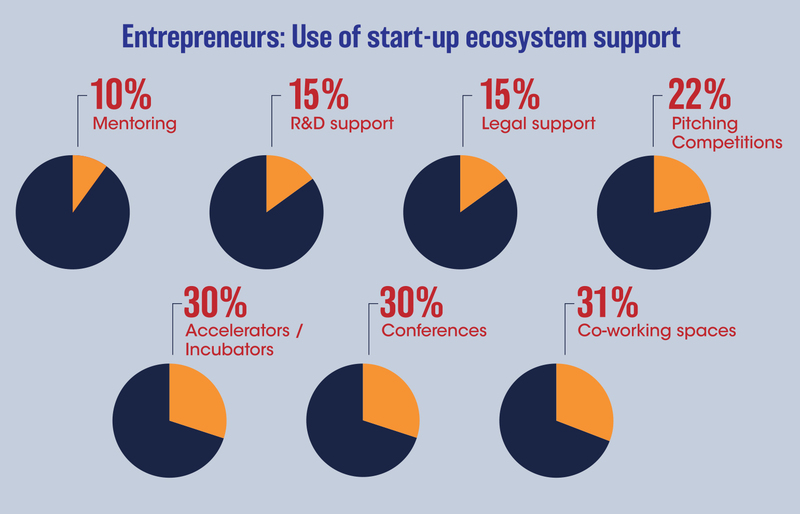 While Hong Kong is currently considered a leading start-up location, ranking third behind the Greater Bay Area and Singapore by student respondents, more can still be done to strengthen its entrepreneurial ecosystem. 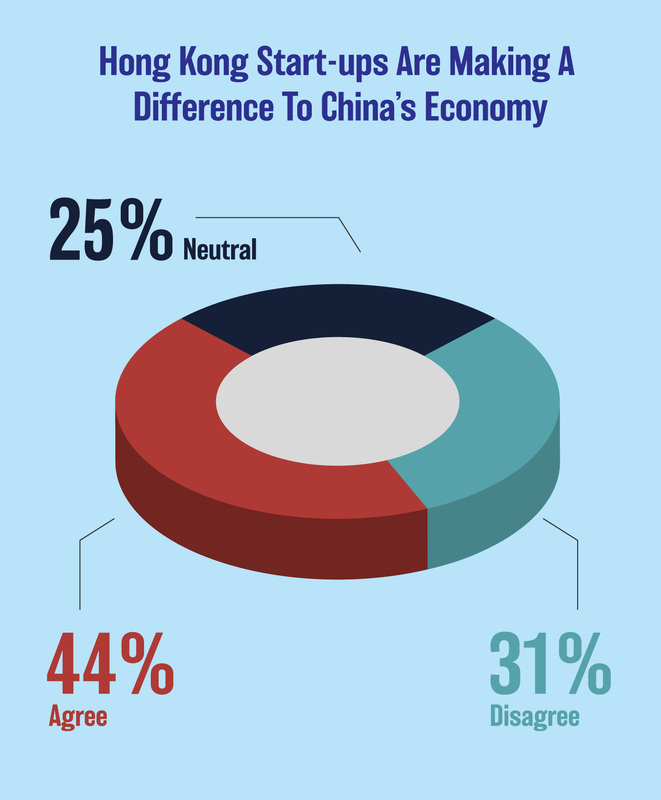 The study reveals that Hong Kong is yet to fully capitalise on its role as the gateway into mainland China, with only 31% of entrepreneur respondents indicating that the city’s start-ups are collaborating well with their peers in the Greater Bay Area. The unique strategic position Hong Kong’s core traditional industries enjoy is becoming less relevant in a digitised world. The shift from the physical transfer of products to the digital transfer of information has altered the market dynamic, with geographical location and language playing less important roles.